To start off the 2014 New Year opened up a box of these fine Romeo & Julieta Maduro Reserve. 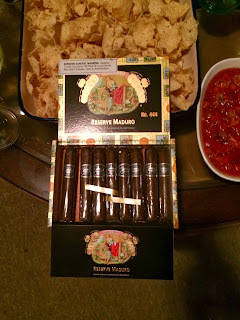 These cigars burn wonderful with a nice dark chocolate taste and earthly aroma. This 1875 label has a ring gauge of 44" is Produced by Menendez y Garcia factory in the country of the Dominican Republic. These cigars were created in 1875 in Cuba, and after the Cuban embargo, production of Romeo y Julieta cigars moved to the Dominican Republic.